It's Saturday, so time for a dog song at Talking Dogs. Today we have a dog song similar to those we sing here at our house. Dog Park Song is a little silly and a whole lot of fun. This music video is pretty self explanatory and inspired by a trip to the dog park. The lyrics were made up as the camera rolled. Sit. Stay. 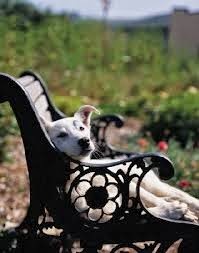 Relax and enjoy Dog Park Song. Fetch more dog songs and dog music videos at Talking Dogs. You'll be surprised at how many we've collected.